The award was open to final-year students of the Tengri Innovation Partnership, an initiative which includes some of the UK’s most influential academic and creative institutions. Designers were invited to present innovative and sustainable approaches to textiles, to meet criteria set to demonstrate forward-thinking conceptualisation of sustainable fibres and practices that rework cultural and traditional techniques. We are so thrilled to have launched the awards with such positive engagement. Our new innovation partnership and awards initiative is a key tool of the Tengri manifesto, working towards a society where sustainable and fair share business is the norm and changing the status quo of the fashion and textile industries. To make this change we need to look to our future global citizens, talent and influencers, supporting the development of sustainable commercial production in education and training. We look forward to welcoming the very talented winners of this year’s awards to the Tengri collective. The Tengri Innovation Award offers an invaluable opportunity to develop a more systemic approach to design and produce sustainable luxury fabrics. This is an exciting new opportunity for our graduates to apply their unique creativity to explore the potential of yak fibres and celebrate both traditional and future craftsmanship skills. Design responsibility is a core element of our course philosophy and we are delighted that our most talented graduates have been recognised for their in-depth research and textile innovation. 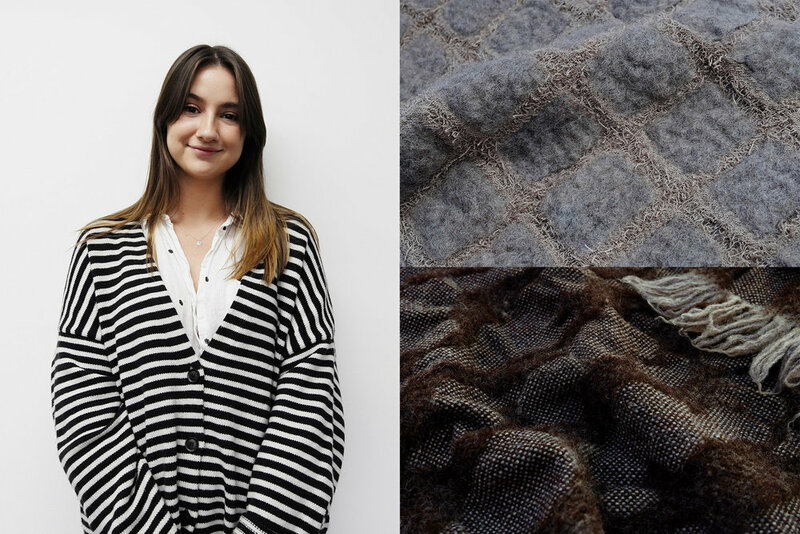 Henrietta’s work is rooted in a deep exploration of natural animal fibres and innovative designs using traditional felting techniques, creating new fabric surfaces with 100% animal fibre. Christopher is accredited for his conscientious approach to sustainability with one-piece pattern cutting, reinventing a traditional tailoring technique used in the early 1900s. Cecile combines traditional and industrial techniques, incorporating an ancient form of crocheting originated in Belgium into her work. Zoe’s amour-like knitwear combines natural materials such as leather skins, wood and soft woollen textures, to create an inventive outlook of future materiality. Congratulations to our 2018 winner and runners-up! Winner: A one-year mentorship with Tengri, as well as six-month paid internship supported with Tengri Noble Yarns for production and a cash prize. Runners-up: Each is awarded Tengri Noble Yarns, fabrics and cash prizes. All winner and runners-up will also be invited to join the Tengri design collective working on the brief for Tengri's 2019/20 collection. Submissions for the award are now closed and will re-open in summer 2019.